Well...according to The Knot I'm way behind on figuring out my wedding invitations (even though the wedding is still five and a half months away...?) so I've decided to start thinking about what to do!! My original inspiration came from this tutorial over on the Silhouette Blog. I really liked the idea but I'm a little confused about executing it and how everything would fit together. Does the envelope with the bow go inside another larger envelope that you mail everything in? The actual invitation would not be that big either. The white square part could only be about 4.3 x 4.3 inches due to the envelope size constraints with the Silhouette, which is pretty small. 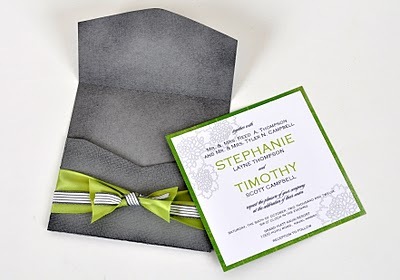 Do you think that is too small for a wedding invitation? I also know it would take a long time to cut out 100 cards, design and print 100 invites, assemble everything, etc. But for 100 invites they will cost about $250 dollars...about $2.50 an invite. Is that expensive for a low budget wedding? I don't even know. Do you think it would be worth it to DIY and save some cash...but have to put a lot of time and possibly frustration into it, or just fork out the cash and order them and not have to worry about it? Any advice or more DIY ideas would be appreciated from you all who have been through this before!!! I don't know if you have an Archivers store near you, but they make the do it yourself invitations easy! Mine ended up being more expensive than just buying invitations, but my bridesmaids and I had fun putting them together. They have all the pre-cut paper you need (http://www.archiversonline.com/pages/cards-invitations-and-announcements-are-easy-with-yours-truly) and I ordered a stamp with all of my wedding information on it. So we stamped and embossed them to make them look official, I printed out all the inserts, and we stamped and embossed a design on the outside of each inner envelope. Hey Rebecca!! I actually went through a printing shop...instead of a true "wedding invitation shop"...it was MUCH cheaper. I actually can't remember how much it was per invitation...but I do think it was pretty far under $2.50 a piece. We went through MinuteMan Press...their wedding invitation shop was called "Occasions". I did go to the shop in Bethlehem to look through their books to find an invitation. I did all of my invitations, menu cards, programs, and rsvp's myself. Check out Paper And More. They have fantastic prices on everything. They also have those fancy pocket type things (I used them), pre-assembled and super cheap. You will also be surprised by how quickly everything can be assembled. Glue Dots are your best friend..for reals! Me, my husband, and my parents assembled all our invitations, with directions, and rsvp's in those fancy envelopes in like an hour...for 240 people. It's totally worth it to put in the effort and do it cheaper. We even had people calling my mom to ask where we got them done because they loved them so much! Even though I ordered mine from David's Bridal (I had a killer discount since all my bridesmaids dresses came from there)...I still had to assemble them. Granted, they were already printed...but the card with the wording had to be slid into a slot on another, larger card. Then there were bows to be tied to each. and. every. single. invite. (around 250-ish) And of course putting together the RSVPs and yadayadayada. My point is--if you can DIY--I'm betting it will be cheaper. Just so long as you're willing and able to put in the time! :) And don't worry about timelines...From the day I got engaged til my wedding day was less than 6 months. You can do it!! My future DIL just bought some cute ones from Michael's at 50% off it was $42 for 50 invites, RSVP cards, and thank you cards with envelopes. She is going to put them through her printer. They have a cute lace graphic and came with ribbon for bows...just a thought! To be honest I cannot remember what any invites I have ever received looked like. I made invitations for my graduations, but opted to buy my wedding ones. All of the stores seem to have fair prices on them, and I would have ended up spending more money on DIY ones. 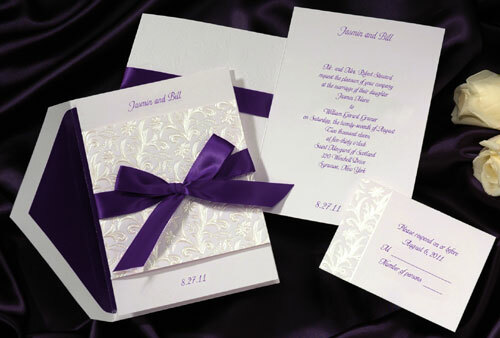 Maybe you could mix it up and order the cards but embellish parts of it like lining the envelopes with fabric/cardstock. I'm not remembering costs...but agree that places like Michaels and even Target have beautiful DIY kits. I would think anything above $2.50/invite is getting expensive. I too ordered from David's Bridal and just put my matron of honor and bridesmaid to work assembling....that's what they are for! Just make sure you get the spelling right on everything!! I mispelled my husband's middle name and it freaked/stressed me out! So I bought DIY kits from Target that were similar to the David's Bridal ones and had my sister print them with the correct name and sent those to his side of the family! It probably wasn't a big deal but the man has his mother's maiden name as his middle name!!! Ah!! There hope that helps!! Hi, I have a small business making wedding stationery (www.heavenlyhandmades.co.uk) so if you want to know how long it takes to make certain invites or are looking for some DIY friendly ideas then have a peek at the site. The smallest invite I do is 4 x 4 inches and is quite small but really popular! Your envelope with the bow would go in a larger envelope. 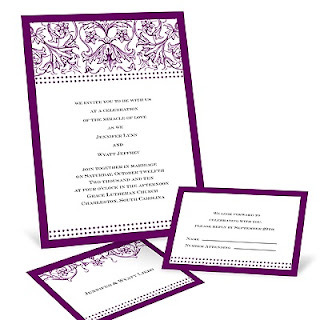 If you search for DIY pocket fold invitations there are loads of places selling them really reasonably. Give me a yell if you want any more info! when I got married my mom designed ours and then took them to the printers I don't remember exactly how much it cost but we sent out over 400 and she said it was way cheaper to do it that way. The last 2 weddings I went to had crafty type invites, I'm sure they were at least partially done by the brides. Both were really cute! My only advice is to make sure and prices out the supplies you'll need first. I ended up spending a fortune on baby shower invites. gosh.. I dont even remember.. I think I got my wedding invites from an online store.. coz I wanted daisies on them (i'm old fashioned).. *wink*.. then I had them printed locally..